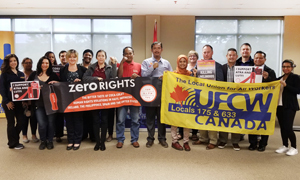 Toronto – September 28, 2018 – UFCW welcomed comrades from Indonesia and former Coca-Cola workers to Canada on September 24, as part of the IUF campaign to shed international light on reported human rights abuses at bottling and distribution locations around the world. The International Union of Food, Agricultural, Hotel, Restaurant, Catering, Tobacco and Allied Workers' Association, or the IUF, reports that Coca-Cola system workers in Indonesia, the Philippines, Haiti and elsewhere are experiencing human rights violations. Indonesian workers shared their experience with UFCW Canada activists and detailed the ways in which Coca-Cola bottler Amatil attacked their fundamental right to an independent, democratic trade union. During the meeting with UFCW Canada, the IUF also reported that Haitian bottler Brasserie de la Couronne has systematically denied workers the right to form and be represented by a union. And in the Philippines, major Coca-Cola bottler FEMSA is refusing to engage in meaningful collective bargaining with the Filipino unions that represent a majority of Coca-Cola system employees. As part of its corporate social responsibility policy, Coca-Coca has stated its firm commitment to labour rights as defined by the International Labour Organization. Prior to meeting with UFCW in the Greater Toronto Area, IUF activists took part in a mass action at Coca-Cola headquarters in Atlanta, Georgia. To support the Zero Rights campaign to demand the fair and ethical treatment of workers throughout the global Coca-Cola system, send a message to company executives, and share the word through your social networks.